The Collection Crew will come to you! We believe every child should have the opportunity to reach his or her full potential, both as individuals and citizens – that by doing so, they will not only do well, they will also do good. We believe that by changing the course of young lives we can in turn be changing the course of a community’s future. That it could lead to a reduction in poverty and unemployment. Or to safer schools and neighbourhoods. To find out more about the Big Impact of Mentorship that Big Brothers Big Sisters of Winnipeg provides please click here. 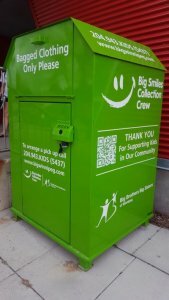 Big Smiles Collection Crew’s Fun Facts! 30,000 lbs of clothes picked up per week! That’s 1,560,000 lbs per year! 9,000 lbs of miscellaneous household items per week. That’s 468,000 lbs per year! Recycling these items helps keep them out of landfills. Recycling helps everyone. We stop at 1,500 houses a week. Your clothing donations and small household donations help mentor over 700 kids in our community!